The original Globe Theatre, built in 1599 by the playing company to which Shakespeare belonged, was destroyed by fire on June 29, 1613. The reconstructed Globe Theatre which was completed by June 1614 and closed in 1642. A modern reconstruction of the original Globe that opened in 1997. Shakespeare's company erected the famed Globe Theatre, circa 1599, in London's Bankside district. The open-air, octagonal amphitheater was three stories high and had a diameter of approximately 100 feet, with a seating capacity of 3,000 spectators. Plays were performed on a rectangular stage platform that was about 43 feet wide and 27 feet deep. The staging area likely housed hidden trap doors in its flooring and primitive rigging overhead to create various stage effects. In 1613, the Globe burned to the ground when a shot from a cannon during a performance of Henry VIII ignited the thatched roof of the gallery. A new Globe was created by the theater company on the foundations of its predecessor before Shakespeare's death. However, in 1642, after years of continuous operation, it was closed by the Puritan government which closed all London theaters on moral grounds. The building was demolished in 1644 to build tenements upon the premises. For the next 352 years, the once-famous Globe was nothing more than a memory. In 1989, the foundations of the Globe Theatre were discovered, reigniting public interest to build a modern version of the famed amphitheater. Led by the vision of the late Sam Wanamaker, an American actor, director, and producer, workers began construction in 1993 on a new theater close to the site of the original. Completed in 1996, the current Globe Theater was officially opened by Queen Elizabeth II on June 12, 1997, with a production of Henry V. A faithful reproduction of the Elizabethan model of the original Globe, it seats 1,500 people. In its opening 1997 season, the theater attracted 210,000 patrons and still draws capacity crowds as well as many tourists. 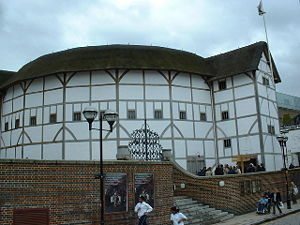 The original Globe was an Elizabethan theatre that opened in Autumn 1599 in Southwark, on the south bank of the Thames, in an area now known as Bankside. It was one of several major theaters located in the area, the others being the Swan, the Rose, and The Hope. 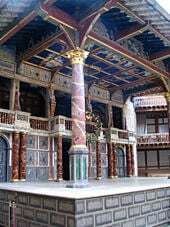 The Globe was the principal playhouse of the Lord Chamberlain's Men, later called the King's Men, to which Shakespeare belonged. Most of Shakespeare's post-1599 plays were staged at the Globe, including Julius Caesar, Macbeth, Othello, King Lear, and Hamlet. The Globe was owned collectively by actors, all but one of whom were also shareholders in the Lord Chamberlain's Men. Two of the six Globe shareholders, Richard Burbage and his brother Cuthbert Burbage, owned double shares of the whole, or 25 percent each; the other four men, Shakespeare, John Heminges, Augustine Phillips, and Thomas Pope, owned a single share each, or 12.5 percent. These initial proportions changed over time, as new sharers were added. Shakespeare's share diminished to roughly seven percent over the course of his career. The Globe was built in 1599 using timber from an earlier theater that had been built by Richard Burbage's father, James, in Shoreditch in 1576. Called simply The Theatre, the structure was dismantled after a 20-year lease on its land expired, and the lumber was then transported over the Thames to construct The Globe. The Globe Theatre was highly successful. Since there was little artificial light, performances were held in daylight, in the afternoon, usually beginning in May. Flags waving in the wind advertised plays by the King's company, and all about the grounds playgoers would be buying merchandise and refreshments out of stalls. People from all walks of life in Elizabethan London could enjoy the tragedies and comedies by the era's greatest playwright, William Shakespeare. Equally popular for the Globe theatergoer was seeing everyone else at the play. Men and women would attend the plays, but the well-to-do would frequently wear masks to hide their identity. The lower classes, or commoners, known as Groundlings or Stinkards, would have stood in the theater pit and paid one penny to see the play. The box they put their entrance fee into gave rise to the term 'box office.' Around the central yard were galleries of seating which were more expensive than standing area. The nobles would have paid as much as five pennies for the cushioned seats found in the Lord's rooms. While Queen Elizabeth I herself loved the theater, she would not have attended a Globe performance, or any other amphitheater production. She is known, however, to have seen command performances of Shakespeare's plays in other locations. After years of success, The Globe went up in flames on June 29, 1613 during a performance of Henry VIII. A theatrical cannon, set off during the performance, misfired, igniting the building's thatching and wooden beams. According to one of the few surviving contemporary accounts of the event, no one was hurt except a man who put out his burning breeches with a bottle of ale.A new Globe was created by the theater company on the foundations of its predecessor before Shakespeare's death. After the Puritans, led by Oliver Cromwell, gained control of Parliament, their campaign to enforce a higher standard of morality spelled an end to the Globe. Their strict religious views caused the curtailment of many social activities, and their stricter code of conduct outlawed any behaviors they found bawdy, foolish, or boastful. Like all the other theaters in London, the Globe was closed down in 1642. After the English Civil War began, the Puritans destroyed the Globe altogether, in 1644, to make room for tenements. Its exact location was forgotten and remained unknown until remnants of its foundations were discovered in 1989 beneath Anchor Terrace on Park Street. There may be further remains beneath Anchor Terrace, but this eighteenth-century terrace is itself listed as an historical building and currently may not be disturbed by archaeologists. The Globe's shape and size have been the subject of scholarly inquiry over the last two centuries. The evidence suggests that it was a three-story, 100-foot-wide, open-air amphitheater. 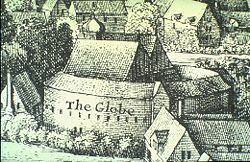 The Globe is shown as a round building on a contemporary engraving of London. On this basis, some assume the building was circular, while others favor a polygonal shape. Archaeological evidence suggests the playhouse had 20 sides. At the base of the stage, there was an area called the pit, or yard, where, for a penny, spectators (called "groundlings") would either stand or sit on the ground to watch the performance. Groundlings would eat hazelnuts, oranges, and other snacks during performances, as evidenced by the discovery of nutshells and orange peels during the excavations. Around the yard were three levels of seating, which were more expensive than standing. The stage of the modern Globe Theatre. A rectangular stage platform, also known as an 'apron stage,' thrust out into the middle of the open-air yard. The stage measured about 43 feet in width, 27 feet in depth, and was raised about five feet off the ground. On this stage, there was a trap door for use by performers to enter from the "cellarage" area beneath the stage. There may have been as many as four smaller trap doors around the stage. Often the area beneath the stage is also called "Hell," since supernatural beings (such as the ghost in Hamlet) enter and exit the stage from this area. Large columns on either side of the stage supported a roof over the rear portion of the stage. This ceiling was called the "heavens," and was possibly painted with images of the sky. A trap door in the heavens enabled performers to "fly," or descend, using some form of rope and harness. The back wall of the stage had three doors on the first floor and a balcony on the second. The doors entered into the "tiring house" (backstage area) where the actors dressed and awaited their entrances. The balcony housed the musicians and could also be used for scenes requiring an upper space, such as the balcony scene in Romeo and Juliet. In addition, it could be used as the "Lord's Room," where higher-paying audience members could be seated – more to be seen than to see the play, since they would have been behind the performers. Gallery Depth: 15 ft., 6 in. Overall height: 36 ft., 6 in. Heights from floor to floor: 15 ft., 6 in. ; 11 ft., 3 in. ; and 9 ft., 9 in. to the plates. Heavens ceiling height: 26 ft., 9 in. At the instigation of American actor, director, and producer, Sam Wanamaker, a new Globe theatre was built according to an Elizabethan plan. The design team comprised Theo Crosby of Pentagram as the architect, Buro Happold as structural and services engineers, and Boyden & Company as quantity surveyors. It opened in 1997 under the name "Shakespeare's Globe Theatre." Mark Rylance was appointed as the first artistic director of the modern Globe in 1995. In 2006, Dominic Dromgoole took over. The reconstruction was carefully researched, so that the new building would be as faithful a replica as possible. This was aided by the discovery of the original Globe site itself, as final plans were being made. Modernizations include the addition of sprinklers on the roof to protect against fire, and the fact that the theater is partly joined onto a modern lobby, visitors center, and additional backstage support areas. Due to modern Health and Safety regulations, only 1,300 people can be housed during a show, less than half the estimated 3,000 of Shakespeare's time. The new theater is 200 yards from the original site and was the first thatched roof building permitted in London since the Great Fire of London in 1666. As in the original Globe, the theater is open to the sky and has a thrust stage that projects into a large circular yard, surrounded by three tiers of steeply raked seating. Tickets to stand in the yard—no sitting allowed—are available for every performance at five British pounds each. The only covered parts of the amphitheater are the stage and the more expensive seated areas. Plays are normally performed between May and the first week of October. In the winter, the theater is used for educational purposes. Tours are available all year round. ↑ Globe Theatre Fire. william-shakespeare.org, Retrieved July 30, 2007. ↑ John Orrell, The Quest for Shakespeare's Globe, (Cambridge University Press, 1983. ISBN 9780521247511). Globe Theatre Study Guide www.cummingsstudyguides.net. This page was last modified on 23 June 2017, at 16:22.